President Mustafa Akıncı said that the agreement regarding the Geneva conference and its participants is very clear and there is no need to expand on it further. Akıncı said “The UN is already engaged and the UN Security Council is supporting the process. The only exception is the EU, just like in Bürgenstock. If the parties stay loyal to the Bürgenstock format, there will not be any problems”. The meeting of the two leaders, President Mustafa Akıncı and the Greek Cypriot Leader Nikos Anastasiades, began at 7.30pm in the UN buffer zone. It continued for about three hours. Returning to the Presidential Palace after the meeting, Akıncı stated that he met with the Greek Cypriot Leader Nikos Anastasiades for the second time after the 1 December meeting and indicated that they will meet on 9 January 2017 in Geneva within the framework of the agreed consensus on 1 December 2016. The five-party conference will start on 12 January, 2017. Akıncı stated that the format of the agreement included the three guarantors. Another part of the agreement includes the efforts of the negotiators to come together, and work intensively to find new arrangements for outstanding issues ahead of the 9 January. Akıncı highlighted that according to the agreement, the leaders will meet as needed, negotiators will review their work and reach new agreements, and a summit will be held between 9-12 January without any preconditions. Meanwhile, President Akıncı officially invited political party leaders represented at the TRNC Assembly to accompany him during the talks in Geneva in January. 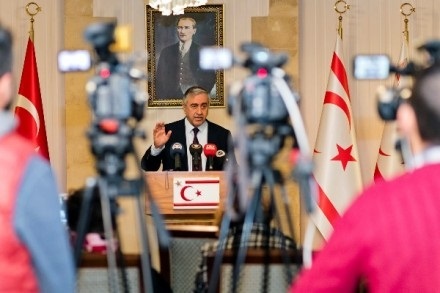 Drawing attention to the critical phase reached in the talks, Akıncı pointed out the importance of the widest possible participation of the political spectrum of the Turkish Cypriot community during the talks in Geneva. This entry was posted in News and tagged 5-party Conference Geneva, Cyprus negotiations, Mustafa Akıncı, North Cyprus, TRNC. Bookmark the permalink.